Chitabe Camp is a luxurious 8-roomed tented camp built on one of the most beautiful islands in the Okavango Delta, in a private area which is bordered on three sides by the Moremi Game Reserve. The area is surrounded by waterways and lagoons, where a variety of wildlife can be found. Accommodation consists of 8 spacious East African style tents that are built on elevated wooden decks, beneath the lush tree canopy. 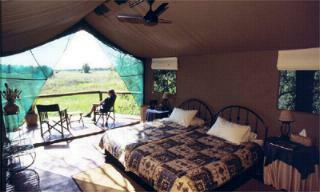 Each tented room has en-suite facilities with flush toilets, a shower and basin with hot and cold running water. The thatched dining area, lounge and pub are also raised on decks overlooking the surrounding flood plains, and a pool allows guests to cool off from the heat of the day. Activities consist of day and night game drives in open 4x4 vehicles accompanied by an experienced guide, as well as nature walks. 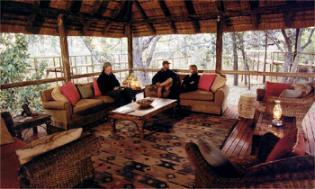 Game viewing is good, and includes Buffalo, Elephant, Lion, Leopard, Cheetah, Reedbuck, Lechwe, Impala, Zebra and Hippo. Wild Dogs are also sometimes sighted. Access into this area is only by aircraft. Chitabe Trails and Chitabe main camps are within walking distance of each other and hence can be combined for a group of up to 24 guests.